After a power outage brought Delta Airlines systems to a near-standstill late Sunday night, airline officials apologized and said all hands were on deck Monday to manage the backlog caused by the outage. 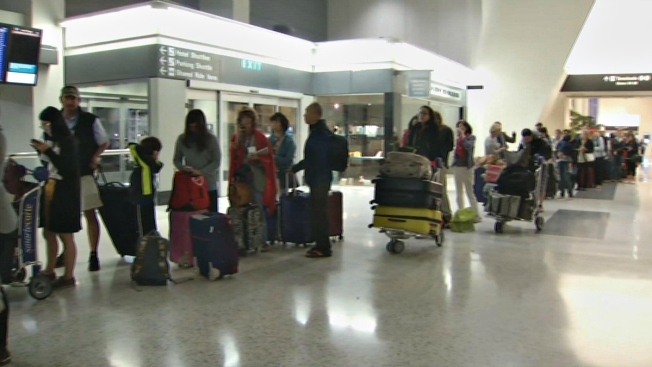 Some passengers at San Francisco International Airport had boarded their flights before the outage and sat on their plane for four hours before deboarding and heading back to the long lines inside the terminal. "I'm trying to keep it together," said Summer Doty, of Santa Cruz, who had been at SFO since 10 p.m. Sunday and was still in line Monday evening. Doty was traveling with her 5-year-old. Passengers were told to get off their flights, pick up their bags at baggage claim and then wait. "I'm never going to make the connector in Atlanta to get home to Toronto," passenger Alex Chan said. "So, yeah, still waiting." Delta, the world's third-largest carrier, canceled 650 flights, stranding passengers worldwide and prompting apologies from CEO Ed Bastian. IT experts said that Delta and other airlines have grown so much in recent years that their computer systems are too dated to manage demand. Delta resumed a limited number of departures Monday morning but warned passengers to expect cancellations and delays. Passengers may opt for a full refund of their ticket price if their flight was delayed or canceled, Delta said. Passengers with flights scheduled between Aug. 8 and Aug. 12 who wish to change their ticket may due so without incurring change fees.